When my kids were young I took one of my well worn t-shirts to an embroiderer and had “practice skepticism” embroidered on it. This was back in the days when I had no time or interest to shop for clothes, so that t-shirt got lots and lots of wear. I still have it and can’t throw it out because I feel so aligned with that guidepost. Let’s be clear though, it’s not that I don’t believe anything or anyone, in fact trust is something that comes easily and naturally for me. 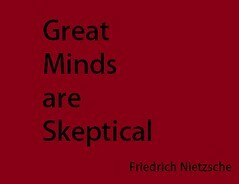 So, skepticism is not a religion for me, just a guidepost. The way I use it is as a filter for everything incoming. When I hear religious or medical or educational dogma, have a conversation with someone or read something in which new or unfamiliar information is imparted, I love it because it gives me yet another chance to do some fresh thinking, maybe some research, rethinking and even change. What feels good to me is the solidity, the clarity, of being my own light.I don’t need a guru or dogma or another to tell me what is right or how to act because I know I am fully capable of listening, observing, thinking, rethinking, exploring, understanding, and then either shifting my thinking or actions according to what feels most in alignment with what feels good. I am my own teacher and pupil. There’s never any fear that I won’t please someone else, or fail, or not live up to externally dictated standards, because I love reveling in the taking of full responsibility for what I think and how I act, with myself and with everyone around me. The reward is self-fulfilled harmony and it is always harmonic because I myself am the tuning fork. It’s a beautiful, beautiful life! There is something so perfect about creating our own recipe for life. There are so many resources/ingredients coming to us always in the form of people, articles, books, videos, intuition, etc.! The recipe is always changing and evolving according to the information we have on hand and the tools with which we are working at any given time. I guess I live like I cook! There was a time in my life when I thought I knew the ‘right’ recipe or had the ‘right’ ingredient… for everyone. In fact, many times when I would discover information so powerfully life changing for me, I would make the leap that this was what was right for everyone. I wanted to spread this news far and wide and have everyone jump on. I still share exciting new discoveries and ponderings (here, for example) but I understand now that everyone has (and should have!) a distinctive recipe for their own personal needs, styles, approaches, and desires. It is really about choosing and incorporating knowledge, relationships, practices, etc. that feel intuitively right and true at our core – not from a place of moving away from but from a place of moving toward. I am wary of the ‘professionals’, gurus, preachers, whoever – those who try to show ‘the way’ – not necessarily because they don’t have an important ingredient but because often they purport that they have my whole recipe. This, to me, is the stuff of cults. When we stop learning, considering, and practicing with consciousness, we have become a follower. I will make my cake and eat it, too! And then I’ll tweak the recipe, eat, repeat. ← You Don’t Need to Be Happy For Me… I can do that for myself. I am often heard saying, “I’m skeptical, not cynical.” I question most everything I encounter, but as a default, I am not distrusting in popular ideas. I judge everything from my own inner compass. I act instead of react. Crititcal thinking skills seem to be a major part of being skeptical in a healthy way. My husband and I have had many a discussion about if critical thinking is a personality trait, a part of natural intelligence, or if we teach it. I’d be interested to know other’s opinions on this. “I act instead of react.” Love that. IMO, critical thinking is natural and nurtured. The popular parenting and educational philosophies blanch the individual’s ability to discern what is appropriate for themselves at every juncture and then there is the expectation that they will have ‘learned’ critical thinking in order to use it in the ‘real world.’ A newborn baby knows and expresses exactly what he/she needs. This understanding grows as the child grows and spreads into all aspects of their lives as they are supported in testing the waters, experiencing and evaluating consequences, and communicated with. If we have a firm grasp on our selves as whole, we are much less likely to swallow someone else’s truth without first using our personal compass. My experience has shown me that critical thinking is a natural ability and the birthright of every person. What our culture labels the ‘terrible twos’ for example is the two-year-old’s revolt against the thwarting of his need to develop his own way of thinking, experimenting with his world, etc. So much of parenting, ‘education’ and religion are classically designed to inhibit or thwart one’s natural drive to think critically. Whenever there exists a ‘core curriculum’ or moral/ethical dogma, or any kind of unasked for ‘teaching’ there exists a thwarting of critical thinking. I find it so interesting that our culture says that the value of formal education, secondary and post secondary, is to teach the student ‘how to think’ and that we buy this premise hook, line and sinker. How to think is the same as what to think. Critical thinking, that ability to think independently, with a kind of fresh slate, without regard for what has been done, what others will think, whether you are different or the same, etc. is a rare state. Perhaps we have critical thinking taught out of us. I don’t know. I know a lot of people who completely lack it. They buy into everything based on the “group” with which they identify. I have (almost) always thought for myself (even when I was aware that life would have been *easier* if I didn’t). However, when I was in college taking classes in experimental science, I seriously learned the skill and value of critial thinking. That, plus a few psychology courses where I learned how easy it is to be duped by social systems. I don’t really care if people disagree with my own conclusions, but I certainly appreciate their opinion if I can see that they gave it careful thought instead of just buying in to someone else’s emotional and biased diatribe. I love skepticism. I love that my child practices it with a vengeance. He may have been born with it. Maybe he had his dad and I (and other family) as models for it. I also think that if you have it taught out of you, there are certainly life experiences that give you the opportunity to unlearn it. absolutely. it doesn’t matter what the group is, most folks just want to follow a group, whether it’s a mainstream line of thinking and doing or a subversive one. critical thinking is certainly not exclusive to a certain group or line of thought! (although I must say that this is one of the motivating reasons we decided to publish these magazines and blog – not to convince anyone to adhere to our worldviews, but to create their own) I can identify with your exposure to critical thinking in college. that might have been my first real respectful (not just plain rebellious) exposure, psychology and philosophy courses. I still spend a whole lotta time in those arenas! actually, I did not learn respectful critical thinking in the coursework at college, but in privately sought after hours discussions with professors, as I felt determined to seek answers to the dissonance I was feeling with the theories purported in the classes. I am grateful for that process. I absolutely love what you both have to say! Parents are disempowered by labels and dogma; often without realizing it. In my fourteen years of being a parent, I have found that it most often happens in those moments of self doubt. It’s really easy during that time to grab onto the enthusiasm of someone who seems to have found all the right answers to something they have been struggling with. Parents are the only ones who inherently know what will work for them and what won’t. I think there must be a balance between common sense, what fits our and our children’s personalities and what our “gut”, or intuiton, tells us will be the right path at that time. Yes, it is easy when we are having a rough time to grab for someone else’s answer. Unfortunately, this often leads to more rough times as we continue to doubt our abilities when this answer doesn’t fit our personal story. But I want to be clear that I also don’t think that ‘what works for me’ can be used as a cop out on change/growth. While the logistics of our situations are quite varied, we can all work on creating peace and coming from a place of love and openness as we practice skepticism and apply it in our own way. Right? Totally agree! I know what you mean about using it as a cop out for growth. I also think as long as you can always be in that place of love and openness you will recognize when things aren’t working be able to find the right solution that is best for your family. I find that the kids are a tremendous help sometimes with that! self doubt is the result of the classically conditioned way most of us have been raised and trained, afterall, and we are constantly seeking ways to become stronger, more confident, more able, truer to ourselves, etc. As parents it is critical, in an effort to avoid such lifelong baggage for our children, to listen, respect, honor and give their voices opportunity for full expression from birth onward. It’s easy, really it is, especially when you begin from birth (perhaps even conception, or preconception!) and don’t have to try to fix later the damage done earlier on. Yes! Self doubt IS classically conditioned! I have never heard it put that way and that is so on point! Thank you!